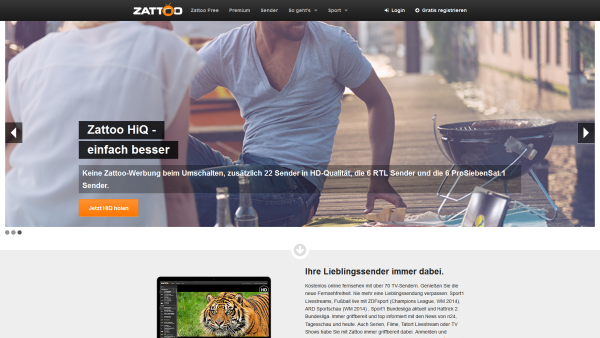 Zattoo was the first provider of live TV in Europe, and is now one of the leading sources of live TV. Launched in 2006, Zattoo’s popularity has escalated with close to ten million registered users internationally. Providing live streaming of over 200 channels for six different countries, Zattoo is available in two viewing options: as a free ad driven service or as a premium subscription service. Zattoo content is also available on a range of devices (although this varies per country), allowing live TV viewing on the go. As Zattoo only operates within a select number of countries (Germany, Spain, Switzerland, Denmark, France and the UK), many countries will find Zattoo is unavailable to them. This is due to copyright and licensing agreements that Zattoo has with their content providers. Geo-blocking, the restriction of website access based on a visitor’s geolocation is used to ensure Zattoo offer adequate protection to the content they’re sharing (by blocking access to certain countries). Geo-blocking is also in place to prevent unauthorised viewing of international channels by those users that have it available. For example, UK users are restricted to watching a UK set of channels. Zattoo outlines on their website that the reason they do this is so that they can offer a “fully legal service”. Users outside of Zattoo’s operational countries or those users that are limited to certain channels will thus require a VPN to unblock content. How can a VPN help Unblock Zattoo? If you live outside of the countries Zattoo caters for, a VPN can assist you in unblocking Zattoo content (providing it has servers in one of those six countries). By connecting through a VPN to a server in one of those countries, users’ traffic is assigned an IP address relevant to that location. As the geo-blocking is enforced through IP addresses, Zattoo will think the user is accessing their services from an authorised location. This belief is what will allow the user to access all content available to that location. Your choice of the VPN’s server’s location will depend on what channels you want to view, so you may need to change servers if you want to watch a British channel and then view a program on a French channel (for example). To do this you’ll need to connect to the VPN’s UK server and then connect to their server in France. This is why it’s important to ensure the VPN provider you choose has servers in the countries that Zattoo provides to. PureVPN for example has a lot of Servers which are “Zattoo compatible”, just download the PureVPN software and try it! A VPN will also offer you protection if you don’t want your Zattoo viewing to be tracked. This is because a VPN offers an encrypted tunnel between the user and its servers. The encryption ensures your real IP address remains hidden to the websites you view and only the existence of the connection is visible to your network administrator and ISP. Although most VPNs offer a highly secure connection, you can compare VPN providers and opt for one that offers a higher degree of security if you feel it’s necessary.